Alexandra Drakaki is an MD, PhD and board certified Oncologist / Hematologist. 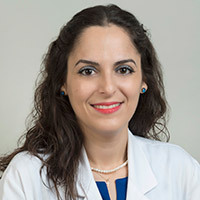 She received her training in Internal Medicine at a Tuft's University affiliate program while she completed her hematology / oncology training at Beth Israel Deaconess Medical Center at Harvard Medical School and her research fellowship at Dana Farber Cancer Center Harvard Medical School in Boston. She specializes in genitourinary cancers and specifically cancers of the bladder, testis, urethra, prostate and kidney. She is the Primary Investigator in several ongoing clinical trials that are testing novel drugs in the field. Her research interest is studying the role of a novel class of genes, named non-coding RNAs, including microRNAs and linkRNAs in genitourinary malignancies. Furthermore, she is part of the Translational Oncology Research Laboratory at UCLA in which researchers are working on drug development by using novel technologies for breakthrough discoveries. Dr. Drakaki's research interest is understanding the role of small non coding RNAs in oncogenesis which was also the focus of her PhD. She is currently working on identifying the mechanism by which specific microRNAs are involved in genitourinary malignancies. She is also the primary investigator of several clinical trials that lead to breakthrough approval of novel drugs in the field. Iliopoulos D, Satra M, Drakaki A, Poultsides GA, Tsezou A. Epigenetic regulation of hTERT promoter in hepatocellular carcinomas. Int J Oncol, 34(2):391-9, 2009. Drakaki A, Iliopoulos D. MicroRNA gene networks in oncogenesis. Curr Genomics, 10(1):35-41, 2009. Drakaki A, Hatziapostolou M, Iliopoulos D. Therapeutically targeting microRNAs in liver cancer. Curr Pharm Des, 19(7):1180-91, 2013. Drakaki A, McDermott DF. Novel immunotherapies in GU malignancies. Curr Oncol Rep, 15 (3):224-31, 2013. Drakaki A, Iliopoulos D. Gene and microRNA signaling pathways in pancreatic cancer. Chang Gung Med J, 2013. Hatziapostolou M, Polytarchou C, Aggelidou E, Drakaki A, Poultsides GA, Jaeger SA, Ogata H, Karin M, Struhl K, Hadzopoulou-Cladaras M, Iliopoulos D. An HNF4α-miRNA inflammatory feedback circuit regulates hepatocellular oncogenesis. Cell, 147(6):1233-47, 2011. Lee JJ, Drakaki A, Iliopoulos D, Struhl K. MiR-27b targets PPARγ to inhibit growth, tumor progression and the inflammatory response in neuroblastoma cells. Oncogene, 31(33):3818-25, 2012.